The future is inescapably the past, or so it often seems in What Future. 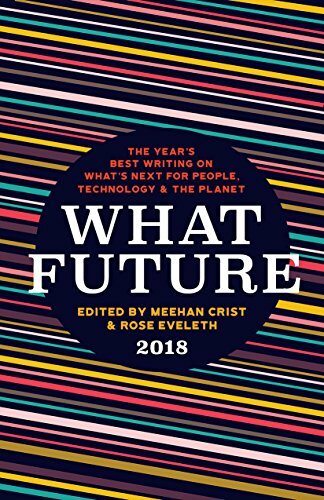 The anthology starts strong with Ed Finn’s “How Predictions Can Change the Future,” which explores how algorithms, from Facebook to Google’s autocomplete, “snuggle right in there between our complacency and our anxiety to fill the empty spaces . . .” giving us what we think we might want based on past decisions but at the expense of explorations that open to new possibilities. There are interesting explorations of England’s plan for Queen Elizabeth II’s funeral (expected sooner rather than later) and how Luxembourg is leading the privatization of space exploration. What Future’s middle section sags with two unnecessary memoirs, both mired in the past. Walidah Imarisha’s “Science Fiction, Ancient Futures, and the Liberated Archive” raises as many thoughts as thorny questions about what it means to find and preserve the stories of the past in order to provide the knowledge and imagination needed to create a desired future. Lauren Smiley’s poignant “Someone to Watch Over Me: What Happens When We Let Tech Care for our Aging Parents,” Brishen Roger’s “Basic Income in a Just Society,” and Rachel Riederer’s “The Future of Remembering” all offer a complex and thoughtful analysis of questions that don’t lead to easy answers. Bryan Washington’s “The Future in Motion: Why I Judge High School Debate Tournaments” is a needed reminder that the future belongs to today’s passionate, enthusiastic, and optimistic youth. What Future leans left in politics and high-tech in science. The arts and humanities, education, and the social sciences are oddly absent, and while climate change is featured, no other environmental or restoration issues are explored. While What Future’s vision is too often narrow, when it ponders the future we are already living in, whether bad (China’s high-tech police state) or good (Estonia’s digital near-utopia), What Future is worth wondering about indeed. Adrienne Ross Scanlan is the author of Turning Homeward: Restoring Hope and Nature in the Urban Wild. Her essays and creative nonfiction has appeared in anthologies such as American Nature Writing. From 2012 to 2017 she was nonfiction editor of The Blue Lyra Review: A Literary Magazine of Diverse Voices.